New Zealand, 1990, 158 minutes, Colour. Kerry Fox, Alexia Keogh, Karen Fergusson, Iris Churn, Kevin J. Wilson, Melina Bernecker. 1. The impact of the film, awards? Made for television? 2. Jane Campion, her New Zealand background, knowledge of Janet Frame, her vision of a New Zealand author, portrait, the difficulties in Janet Frame’s life, institutionalisation, creativity? 3. Audience knowledge of Janet Frame, her literary output, her reputation in New Zealand? Overseas? Her suffering and her vindication in life? 4. The New Zealand settings, Otago, the farms, the town, cities? The institutions? The contrast with London, with Spain and the beauty of the countryside and sea? The musical score? 5. The insights into literary creativity, the origins of Janet Frame’s inspiration, background, development? Torment? Growth? 6. To the Island: The glimpses of Janet Frame, the fadeouts? The three actresses portraying her? Birth, as a baby, in the paddock, running, her appearance and hair, her movement? The touches of madness? Scratches? At home, the moving in, the boy and the games, the bed and the four children? School, the teacher and her reactions? Poppy, the book and the bath? Language and anger? Her writing the poem, reading it out? Her brother’s fit? The kids in the yard? Issues of health, the examination, the dirt? Her prize, the book? Grimm’s Fairy Tales? The radio? Janet in her teens, more open? The Spanish girl? Confirmation? Shirley, the dream and singing? Swimming and posing? Staying – her work? French? Myrtle’s death, the grave and the flowers? At home, milking the cow? The envy of the romantic girls, their hair? Menstruation and class? The graduation, the sky, the girls singing? The burning of the books and farewell? Her wanting to be a poet and scholar? 7. An Angel at My Table: In the city, Shakespeare? The sick uncle, the aunt? Holidays and talk? The psychologist, Ashley Friendships? Isabel? The chocolates? Going out, the cemetery and the reading? Work, eating, the class and the chalk, her hiding, becoming more reclusive? Unhappy? The patients and their behaviour? Her concern about her teeth? Mrs Chandler? The shock therapy, the details, the eight years, the electricity and the treatment? Dancing, the prize, her being published? Going home? Her relationship with her father, over the years, his character? Frank? Her relationship with her mother? The possibility of working in the hut, Frank and his support, his eccentric behaviour? Writing, success? Her hopes? Discussions with her father, the possibility of leaving? 8. Part 3: Waking, sick, going to London, the grant, going to the hotel, her not being expected? The bathhouse? Patrick, the discussions, his advice? Paris, the trip? Spain, losing her luggage? Colin and the introduction, his gawking? His group? Getting the room, the woman looking after her, her happiness, creativity, looking at herself in the mirror, the sexual relationship, Edwin? The transformation? Bernard, sharing? The liaison, poetry, the American being a poet, their walk, the affair? Breakfast? The swim? Ewan? Leaving, not seeing Janet? The return to London? Discussions with Patrick, his advances? The nurse and the rejection? Painting the doll? The verdict that Janet did not suffer from schizophrenia? The psychiatrist and the chocolates? Writing and publishing? The publishers, the flat, the reception, meeting Alan Sillitoe and his wife? The death of her father, going home? The photographs? The caravan? 9. The portrait of the family, mother and father, Isabel, Junie? The contrast with Isabel being outgoing, and relationships? The father, his support of his daughter? The concern about the institutions? 10. The characters in Janet’s adult life, the doctors, psychiatrists? The move to England, Patrick and his attentions and warnings? The landlady? Going to Spain, the group, the American poet, the affair? 11. The achievement of the film? Portrait of an artist? 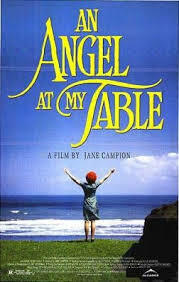 Jane Campion and her appreciation to Janet Frame for participating in the making of the film?